Avengers: Age of Ultron was a massive movie. There was something like a million robots, upwards of five antagonists and one lavish, sprawling set piece after another, each in its own corner of the globe. What better way to follow up what is quite possibly the biggest superhero movie of all time than with what is most definitely the smallest installment in the Marvel Cinematic Universe yet. Get it? Cause small? Cause ants? Cause I’m talking about Ant-Man? Ant-Man applies Marvel Studios’ trademark, money-printing charm to the heist movie, a genre that traditionally entails far smaller conflicts than world-ending androids. The marriage of Marvel style and the heist genre winds up delivering what in many ways is the polar opposite of Age of Ultron. Where Age of Ultron pits a genocidal robot hive mind devising an extinction-level event up against a flying aircraft carrier of speedsters, witches and more benevolent other robots in a city turned into an asteroid, Ant-Man sees a bald guy trying his hand at corporate espionage only to come up against a convict and a van full of his friends in a final battle that plays out on a toy train set. It’s exactly what the doctor order after a movie as dense, and some would argue bloated, as Age of Ultron. Ant-Man is also great in its own right, largely because it’s hilarious. Whether you’ve heard a thousand times already or not, enough can’t be said about how fantastic Michael Peña is as Luis, one of the aforementioned friends in a van. He manages to steal the show from any and all set pieces, action sequences and Michaels Douglas. The movie isn’t without its shortcomings, however. It aggravatingly finds its narrative almost completely reliant on the increasingly asinine “don’t tell the entirely capable, grown woman anything because she needs to be protected” trope. But the best special effects any Marvel movie has boasted so far, coupled with Michael Peña’s out-of-the-park comedic performance make Ant-Man the perfect breath of fresh air between the much bleaker Age of Ultron and the upcoming Captain America: Civil War, which is sure to be a dire tale indeed. Anchorman 2 is so stupid and so smart that I’m having trouble writing about it. When I saw the first Anchorman in 2004 it didn’t resonate with me all that much upon my initial viewing. But somewhere between the twelfth time I saw it and the 1,000th time my friends and I launched into an a capella rendition of “Afternoon Delight” it became one of my favorite comedies. The learning curve for Anchorman 2 was not nearly as steep. And how could it have been? With a joke hitting probably every twenty seconds I could barely keep up. In fact, I’d wager that depending on the first joke you laughed at you might have seen an entirely different movie than I did based on what jokes you heard and what jokes you laughed over. There will be those that insist that Anchorman 2 turns out every cheap laugh it can find in the hopes that one in ten stick, and if you aren’t keen on the sensibilities of any of Will Ferrell and Adam McKay’s previous endeavors you’ll probably agree. This isn’t a movie that’s going to change your mind about Ferrell and McKay’s sensibilities one way or the other. But for my money, save a subplot involving Brick Tamland falling in love with Kristen Wiig, I’d say the percentage of jokes hit was far closer to nine out of ten. The sequel follows the news anchor icon Ron Burgundy and his team (reporter Brian Fantana, weatherman Brick Tamland and sportscaster Champ Kind) through the dawn of 24 hour news. In the internet age it can be hard to contemplate the effects of news suddenly becoming available literally at any moment but Anchorman 2 asks us to think about the effects something that is now a major facet of American culture have had on the American psyche. Can you imagine the sheer sensory overload one would experience tuning into CNN in 1980 and being presented news at any given time, having previously only watched the news in hour long segments each morning and evening? It’d be like sitting through a two hour movie that spews a joke at you every twenty seconds. 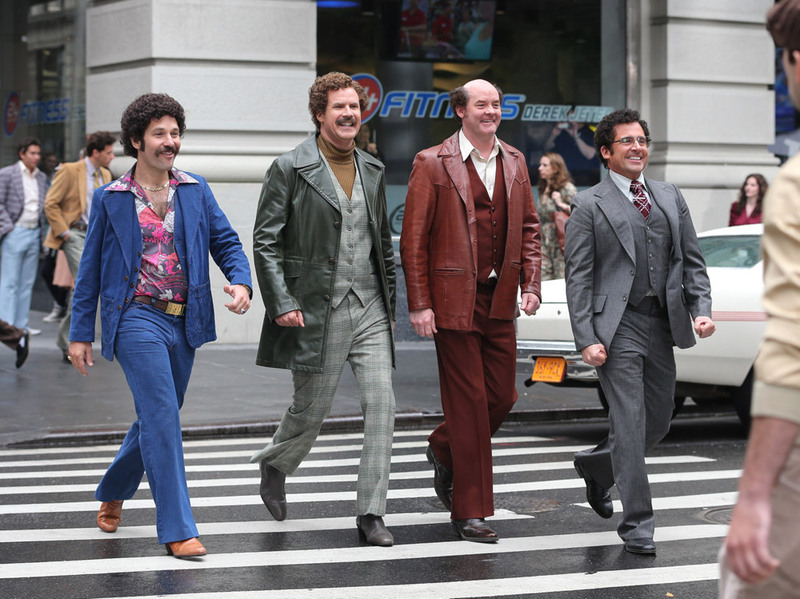 The thesis of Anchorman 2 is that when news becomes available nonstop it’s no longer news. It’s a business with very quantifiable variables that can be tweaked and twisted to produce the most desirable solution and when the most desirable solution is simply the most viewers, telling people what they want to hear becomes exponentially more important than telling them the facts. 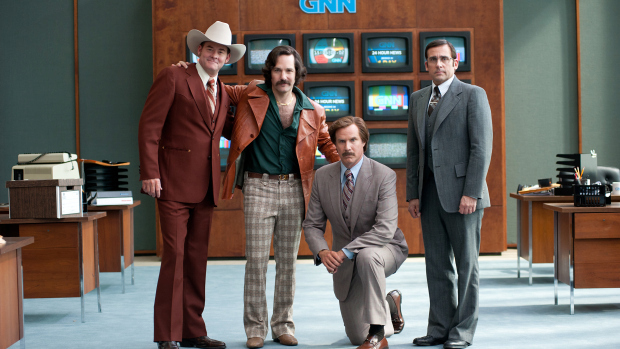 The 24 hour news cycle has made a mockery of journalism, and in turn Anchorman 2 makes a mockery of it. Not the news team we deserve, but the one we need right now. But that’s not to say that Ron Burgundy and the gang stride into frame upon conceptual high horses. The former Channel 4 news team is still a collection of fools and borderline bigots, perpetually affirming our perceptions of ignorance. They’re a little bit racist, a touch homophobic and outright sexist and the world around them treats them like it. It’s funny to watch Ron Burgundy fumble his way through a dinner with a black family, but it’s hilarious to watch the family react. Many of the film’s laughs also come from the literally thousands of celebrity cameos sprinkled throughout. If you have a favorite performer they’re probably in this movie. Through the six degrees of Kevin Bacon, the entire Western hemisphere is in Anchorman 2. And not a soul goes to waste. All this is to say that Anchorman 2 works on several different levels. It’s got a hilarious cast that appear to be having the time of their lives, it has hundreds of jokes and gags ranging from ignorant to brilliant that can easily sustain two hours of laughter and its got something to say that is both an extremely accurate and extremely timely indictment of culture today. It’s one of the stupidest, smartest movies I’ve ever seen. Additionally, Ron Burgundy’s autobiography, Let Me Off At The Top! My Classy Life and Other Musings, is the next Infinite Jest. 1. Boy, the 80’s sure were whacky, huh?